OPC Atlantic Maps Briefing OPC Pacific Maps Briefing. Needless to say, we can request any one of them individually by email request using the NWS's FTPmail or from Saildocs, but to do that, we need a custom request format and we need to know the actual file name for each one—there is also a unique file name for the latest version of each one, as opposed to, say, the file name for the map valid at 18z. As it turns out, the NWS stores these maps in at least three different locations, and the file size for an identical map could be 300 kb one place, 85 kb another, and 27 kb in another. They also differ on the same site in size for a .gif file versus a .TIF file. As far as we can tell, the smallest ones are the .TIF files located at weather.noaa.gov/pub/fax so we have used these. We can find theses files of <30 kb for all of them, which is convenient as some comm sources have limits of 30 kb attachments. Thus we have made a shortcut index to the briefing products that gives the user the opportunity to ask for individual products bypassing the need to first open an online index. Our custom index is in the from of a pdf with active links within it. Thus with this pdf in your computer, you can just open the pdf and then select the link you want.... or mail the pdf to yourself and open it in your tablet or smartphone to get the products in those devices. Another change we had to make from the standard Briefing presentation is to break up the surface analysis into two parts. This is done to keep the file size down. And the important adjustment is to ask for these from Saildocs, which offers the wonderful service of taking these 30 kb files and reducing them by 50% so we can get them at about 15 kb each, sometimes 10 kb. You have a choice to download the image directly when using an Internet link, or choose the other link for each one that prepares the proper request from Saildocs to be send by your email. The Internet request is straightforward (these will come directly from the NWS server), but there are nuances to the email link. Namely, when the link generates the email for you, you must be sure that there is no signature or anything else in the email. It must be a blank email with just the send command in the body. The subject line does not matter. Also, for this to work seamlessly, you will need to have your sat phone or pactor modem connected to the computer as well as being sure that the default email program for your computer is the same as you are using for high seas communications—google something like "setting default email on win7" for instructions on that. Note that we include a link to the list of file names, so you can request any of them directly from Saildocs as shown in any of the live links. This one is actually 13kb. The pic is outdated. Our Briefings pdfs are about 2 MB, but they only have to be downloaded once to your computer from a land line. They are large so you can zoom into the outdated thumbnails to see what each map actually looks like. We also include the update times and approximate file size. The sample shown above, for example, exists for both 00z and 12z valid times, but you would not get the latest 00z map till about 05z or 06z. The latest 12z map would first be available at about 17z to 18z. Update times vary within these limits, but you might be able to pin it down more precisely. The file sizes may vary a few kb as well. Download custom Starpath Pacific Maps Briefing pdf index. Please give it a try and let us know how this works. This is a new idea, so we will need some in practice feedback to learn how to improve it. Please post your comments or questions in the comments section below. We should add that what we offer above is a more convenient format for the maps briefings, but there is also an OPC text briefings and these remain extremely valuable as they are. OPC Atlantic Text Briefing OPC Pacific Text Briefing. because these are extremely valuable, especially in the presence of tropical systems. As we show in that note, you simply cannot get adequate storm forecasting from any graphic map or grib file. We need these text reports. 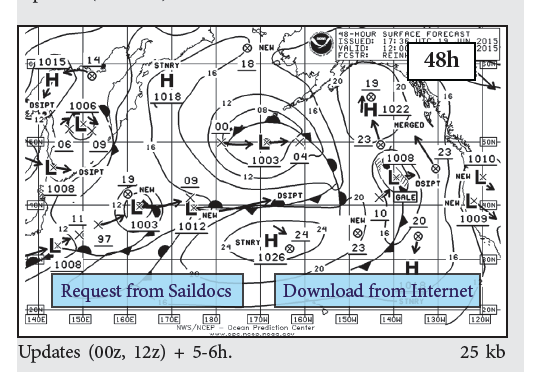 Here is a related article about weather map file size and format. We updated this to v4, May 7, 2018 to include the new 72-hr forecasts. For now these maps are at the FPTsite and at the OPC site, but not yet being broadcast as radiofax maps. We give the direct links for now, and later update this when they start to broadcast them. In the meantime, you can get them here.